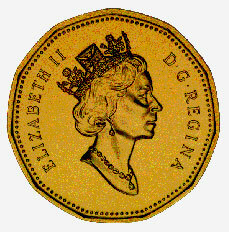 The one-dollar coin featured bears the third portrait of Queen Elizabeth II to appear on Canadian coins. This portrait, introduced in 1990, represents a significant milestone in the history of Canadian coinage, as it is the first portrait of the reigning monarch to be designed by a Canadian. In Great Britain, the portrait of the Queen appearing on coins was changed in 1985, when the design of Raphael David Maklouf, FRSA, was adopted. In Canada, however, the Arnold Machin portrait, introduced in 1965, continued in use until 1989. Machin's model was designed in 1963, when the Queen was 37 years old. When seeking a more mature portrait of the Queen, Canadian authorities decided not to use the Maklouf portrait. Instead, they commissioned Dora de Pedery-HUNT, a Toronto artist and sculptor, to design a new one. Her portrait depicts Elizabeth facing right, wearing teardrop earrings and a diamond necklace. The diamonds of the actual necklace, which was originally made for Queen Victoria, weigh 161 carats. The Queen also wears a diamond crown made for George IV. It is decorated with roses, shamrock and thistle, the floral emblems of the United Kingdom. The result is a pleasing, realistic portrait of the Queen. The one-dollar piece depicted is dated 1990; it forms part of the National Currency Collection, Bank of Canada.